Every great trilogy has a beginning, middle, and end. Bowman Draft is the final piece of the prospecting puzzle. This is the first place to get those cards of newly drafted prospects. Trust me. Collectors and investors were chomping at the bit to get their hands on them. Cards from the core three prospecting sets – Bowman, Bowman Chrome, and Bowman Draft traditionally hold the most value. Everyone wants to get in early on that prospect who they think will turn into the next Mike Trout. Can you blame them? The Mike Trout 2009 Bowman Draft Picks & Prospects Chrome Superfractor Auto #’ed 1/1 sold last year for a whopping $400k. That’s a ton for a modern day baseball card. It certainly didn’t take long for an eye catching sale to come out of the 2018 version of Bowman Draft. From the looks of it, the Nolan Gorman Superfractor Auto sold for $15k. Hopefully the transaction goes through, and the buyer/seller don’t have a falling out. Talk about a lot of money for a card of a guy who was drafted #19 last summer, and has played less than 100 professional games. From an investment standpoint I think its a bit nuts. There are a lot more unproven prospects than Mike Trout superstars. Just because he had 17 home runs in 63 games last year doesn’t mean he’ll be able to keep that going. Single A ball is not the same as the majors. Then again, who am I to say what people should or shouldn’t spend their money on? As you can see, prospecting is very much alive and well. 2018 Bowman Draft comes in two different formats – Jumbo and Super Jumbo. 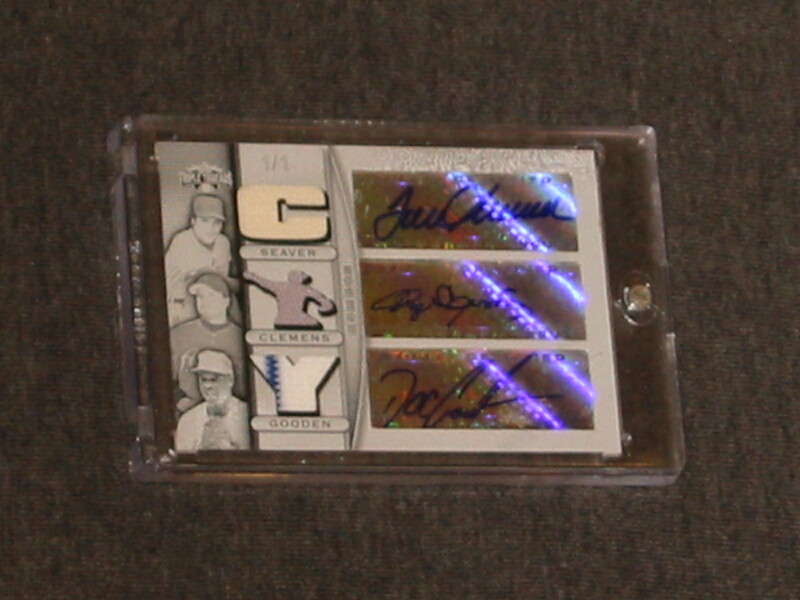 A Jumbo box contains (3) autographs, whereas a Super Jumbo box has (5). The base set contains (200) cards, and has the following parallels: Sky Blue #’ed/499, Purple #’ed/250, Blue #’ed/150, Green #’ed/99, Gold #’ed/50, Orange #’ed/25, Red #’ed/5, Black #’ed/1, and Printing Plates #’ed/1. Each base card has a Chrome counterpart with these parallels: Refractor, Asia Refractor, Sparkles Refractor, Sky Blue Refractor #’ed/402, Purple Refractor #’ed/250, Blue Refractor #’ed/150, Green Refractor #’ed/99, Gold Refractor #’ed/50, Orange Refractor #’ed/25, Red Refractor #’ed/5, Superfractor #’ed/1, and Printing Plates #’ed/1. (14) cards have image variations. These are quite easy to spot. Each image variation has a Chrome, refractor-like finish, and the CMP code on the back will end in #0916. Half of these image variations have autographed versions #’ed/99. The Chrome Draft Pick Autographs are the real meat and potatoes when it comes to this brand. This is where you’re guaranteed autographs will come from anyway. At least most of the time. The Bowman Sterling inserts are back which have a nice clean look. What really stands out to me are the cards celebrating the 20th anniversary of 1998 Bowman. I fondly remember the original 1998 Bowman because that’s where my Jimmy Rollins rookie is from. A buyback autograph of that card would’ve been nice. The 20th anniversary set features young prospects on the old design. Those vertical autographs came out well. I’m from Selinsgrove, PA. One of the Cardinals 2018 draft picks, Nick Dunn, is from Sunbury, PA which is right across the river from me. Its always fun to see a local person get cards. He was a round 5 pick, 153rd overall. I saw him play for the State College Spikes this past summer. Bowman Draft has base and Chrome cards of him with all of the accompanying parallels. No autographs yet. After a very successful revival last year, Topps Gallery makes it’s return in 2018. Once again this product is a Walmart exclusive. So if you’re out shopping for those last minute Christmas gifts, checkout the card section for Topps Gallery. I really like this brand, and what Topps has done with it. It comes in three different formats – Collector’s Box, Blaster, and Jumbo Value Pack. A Collector’s Box is equal to what a hobby box would be, and is the only format that guarantees any hits. Packaged within each Collector’s Box are (20) packs along with (1) Oversized Base Topper. You should find at least (2) autographs. Blasters have exclusive Artist’s Proofs, while Jumbo Value Packs have Canvas Parallels. The base set consists of (150) cards. Parallels include Artist’s Proof (Blaster), Canvas (Jumbo Value Pack), Private Issue #’ed/250, Green #’ed/99, Blue #’ed/50, Orange #’ed/25, Red #’ed/1, and Printing Plates #’ed/1. I’ve seen the Canvas parallels referred to as Wood sometimes. Short Prints are found between #151 and #200. Nine artists came together in order to produce the images for this set. They are Gerry Garcia, Kris Penix, Mayumi Seto, Carlos Cabaleiro, Dan Bergren, John Giancaspro, Kevin Graham, Jeff Mallinson, and Evan Shoman. Lots of these artists have done work for Topps before. Mayumi Seto is responsible for all of the Topps Living Set cards. On the back of each card you can see which artist did the work. Five cards actually list the wrong artist – Ted Williams #163, Ernie Banks #167, Nelson Cruz #169, Robinson Cano #199, and Jackie Robinson #200. These cards attribute Carlos Cabaleiro as the artist when in fact it should be Kris Penix. In addition to the base set and autographs, there is a nice selection of inserts. The Impressionists inserts are quite impressive. Despite not having any parallels, just the inserts themselves get more attention on the secondary market than you’ed expect. I pulled (1) from my Collector’s Box. Although difficult to pull, its possible to own the original artwork used to make these cards. You can only get these pieces in the Collector’s Boxes. It would be hiding in your box topper pack instead of an oversized card. Topps Gallery is one of my favorite looking products. On-card autographs could improve it, but given that its a retail-exclusive stickers make sense. I believe it to be one of their most important retail releases. I bought myself an early Christmas present. Its been awhile since I’ve opened a football product, so I decided to try a box of 2018 Leaf Valiant Football. I’ve had a lot of luck this year between Topps and Leaf products. This box came from Atlanta Sports Cards. In addition to this box, I qualified for (3) 2018 Leaf Holiday Bonus Packs. More to come on those later. No major pulls here, but some nice looking stuff. Every box comes with (4) autographs. One is graded by BGS a 9.5 or higher. Too bad Saquon Barkley signed an exclusive deal with Panini. I would’ve really liked to see him have cards in here. Even though Leaf’s football products are unlicensed, you can’t really tell that when you have a player from Penn State. The Penn State uniforms have little to no logos on them to begin with. Lots of other good guys can be pulled like Baker Mayfield, Sam Darnold, and Nick Chubb. Love it or hate it. Triple Threads has been a staple in the hobby for the last twelve years. You’ve got to admire that type of lasting power. Just think about how many other products have come and gone within that time. Its a lot. I’m a fan of Triple Threads. Always will be. The first time I opened a pack was way back in 2007. This is when the packs came in that crazy triangle shape. It was during my first trip to the National Sports Collectors Convention. That year it was held at what has become my favorite location, the I-X Center in Cleveland. While browsing the show floor, I came across Dave & Adam’s Card World. They were selling Triple Threads by the pack, and I decided to take a shot. Taking it over to the food court, I opened it while devouring a hot dog. To my surprise, waiting inside that pack was a Dwight Gooden/Tom Seaver/Roger Clemens Triple Auto Relic #’ed 1/1. Talk about a tremendous hit that made my first National even more memorable. I know that I’ve told this story before, but its something that I like to do while busting my annual Triple Threads box. Triple Threads has and always will be about the hits. There is a nice looking base set to put together. It consists of (100) cards, and has the following parallels: Amethyst #’ed/299, Emerald #’ed/259, Amber #’ed/199, Gold #’ed/99, Onyx #’ed/50, Sapphire #’ed/25, Ruby #’ed 1/1, and Printing Plates #’ed 1/1. All veterans and retired stars. Like I said before, Triple Threads is 100% hit driven. Its always been a high-end, hobby-exclusive product. We’ll never see a retail version. Each box comes with (2) mini-boxes. Inside each mini-box you should find (1) autograph and (1) relic card. Plus (2) parallels. A master-box should cost around $200. Rookies, veterans, and retired stars/Hall of Famers highlight the hits. There is an endless amount of autographs, jerseys, patches, cut signatures, and booklets that you can get. Its the beating heart of Triple Threads. The fact is, if you enjoyed this brand for the last twelve years you’re most likely going to have fun with it again in 2018. The windows housing many of the relics spell out interesting (at times funny) tidbits about that specific player. I’d like to see some specially made Triple Threads cards for the National Sports Collectors Convention. Relic windows could easily be made to spell out “NSCC”. I could see these as high-end giveaways at the Topps booth or what collectors receive during the Q&A session.